Students tend to leave bar school jobless with empty pockets. 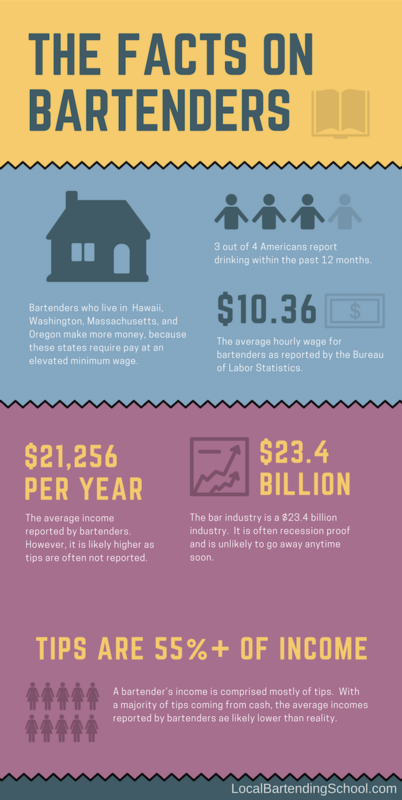 It is important to learn about the bartending process, and more bar owners aren't willing to train someone. 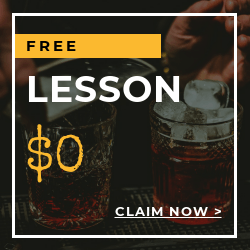 New bartenders should have realistic expectations upon entering bartending school and avoid pouring thousands of dollars into bartending school. A bartending diploma issues no guarantees. Diplomas are needed. The majority of new bartenders completed bartending school prior to working. 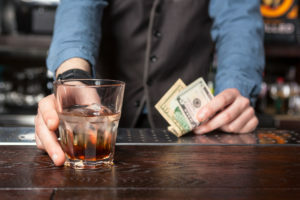 Bar owners highly favor the experience to save their training costs. Furthermore, they are motivated to hire bartenders with certifications for lower insurance premiums. Barman giving whiskey glass with booze - closeup. Some would argue that a majority of successful bartenders never set out to become bartenders. Instead, they started as waiters, waitresses, and bus boys, and they worked their way up. This is also true. The problem with this statement is this is not a clear or guaranteed path. Bartending school catapults people to their career faster than "climbing up the ladder." I think the best way to approach the bartending school question involves your personal goals in becoming a bartender. If you want to learn how to become a bartender as a career and not just a job, I do think that having worked through all of the roles in a bar will help you better understand the entirety of bar operation. If, however, you are more interested in jumping into a bartending job in order to make some good money over the course of a few years, or to get a second job to bolster your income, bartending school is a good way to get a jump-start on the basics that every bartender must know. What Will You’ll Learn in School? Despite whether you learn online or in-person, the core content remains similar. Online courses are easier to fit into your schedule, however, they only deliver visual knowledge, not hands-on experience. Flashy videos can be informative and helpful learning basic knowledge. Bartending is a hands-on process. 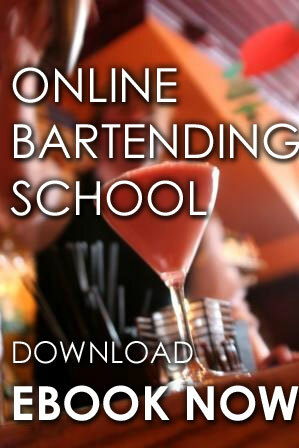 Most graduates of an online course will not feel ready on for a bartending job. It is important to participate in an in-person lesson or class. Courses will involve managing a bar, drink recipes, organization, running a POS (point of sale) machine, and learning alcohol safety. Schools typically run two to seven weeks. Graduates of shorter schools tend to feel comfortable with only basic knowledge. Bartending schools come in all shapes and sizes, and what and how much you learn depends on which one you choose. Longer courses often involve added training in table service, more advanced drinks, flair bartending tricks, and a variety of additional information. Oftentimes the more extensive courses will involve having the students actually go into a bar either to shadow a real bartender or do a bit of real bartending themselves. 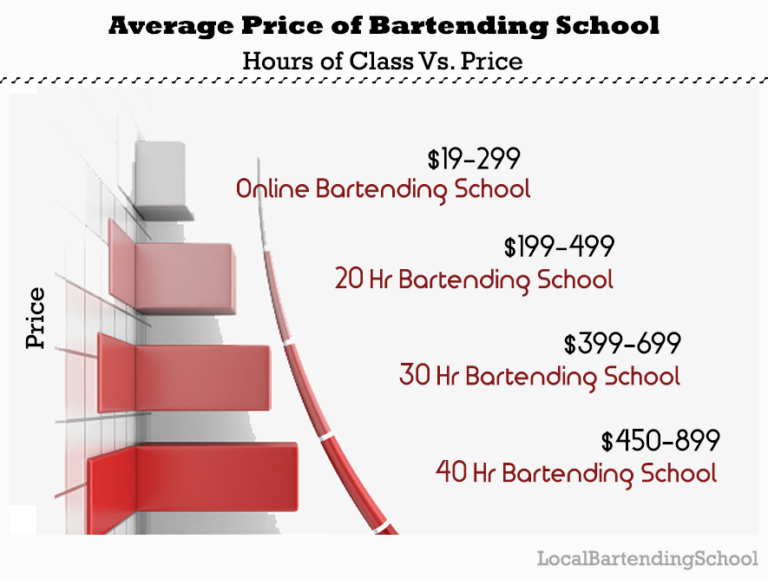 The cost to enroll in bartending school varies greatly. Basic online video courses can run anywhere from $35 to $200, but as I mentioned before, be wary of these sorts of courses, and especially the cheapest ones. Don’t pay for some course that promises training only to have you watch basic videos and read recipes. You can learn all of that using YouTube and a cheap recipe book. *The accuracy of the above pricing is not guaranteed and may be incorrect. Please contact schools for most accurate pricing. In-class courses vary in price based on the length and depth of instruction. It is fairly common to see these programs run in the $200 to $400 range, but sometimes they can be quite expensive. One popular example is the New York Bartending School, which costs nearly $600 for a comprehensive 40 hour class. If you don’t have a very good knowledge of liquors, drinks, and bar tools, but you still want to get into bartending, it might be exactly what you’re looking for. If, on the other hand, you are one of those people who already knows a lot of drinks and is always the person mixing cocktails for everyone else at get-togethers, it might not be able to provide you with all that much new knowledge. As for the expense, if you put down the money on bartending school, complete it, then successfully land a job, you won’t be complaining about the money spent on training. When you get off the clock every night with a pocket full of cash, that few hundred dollars you spent on classes will seem like a pittance.